According to my two picky eaters at home as well as over 50 taste testers at my book signing/smoothie demo in Long Island last week, this smoothie is Berry Delicious! This smoothie has less than 10 ingredients and is perfect for those rushed back-to-school mornings or as an afternoon snack when the kids come home starving! I also freeze a batch of this smoothie in PBA Free Silicone Popsicle Molds and put one of the Popsicles in their lunchbox in the morning and it is half thawed and ready to eat at lunchtime. Bananas are a great source of vitamin B6, vitamin C, potassium and manganese and helps metabolize fats and carbs. Flax seeds are mood and brain-boosting fatty acids and add a nutty flavor to compliment the sweet and tart berries. Baby spinach is a great source of vitamin A, iron and calcium and berries are full of antioxidants, vitamin C, and low in sugar. Since both spinach and berries are part of ‘the dirty dozen’ and contain a high pesticide load, you should buy that produce organically. Hemp seed is high in protein, making this smoothie a complete meal. This smoothie does not contain any refined sugars and uses raw organic honey and one date for extra sweetness. Click play button to view my video demo of making this smoothie. Written ingredients and directions are listed below. To save time in the morning, you can make this smoothie the night before. 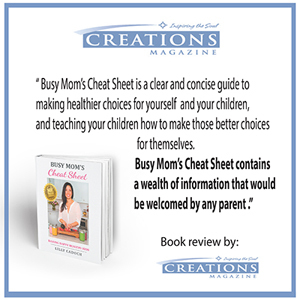 For more recipes like these check out my book, “Busy Mom’s Cheat Sheet: Raising Happy Healthy Kids”, now available on Amazon.